How are you managing your career? Are you in your dream job or are you still working towards it? In either case, it is important to continue growing both personally and professionally because the world is perpetually changing around us. And in the 21st Century, that change is both rapid and profound. What steps are you taking to remain relevant? Do you have the skills you need to succeed today and tomorrow? Each job has its own set of skills that you need to master to perform well in your role. But if you want to rock your career, you need to do a lot more than simply mastering your current role. In Jamaica, there is a commonly used word in the vernacular called brawta. It means extra, a gift, a bonus. What brawta can you bring to the table? That’s what sets you apart and makes you more marketable to employers and more valuable to yourself. 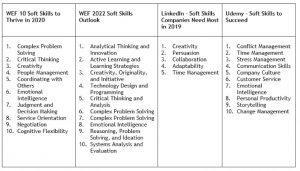 The World Economic Forum (WEF) has a set of 10 skills it says you need to thrive in 2022. LinkedIn analyzed its data and came up with five skills professionals need to succeed this year. And Udemy, the online learning platform, reported on 10 skills that you need to succeed. Do these lists resonate with you? And does it really matter? Just looking at the table above is overwhelming and can paralyze you if you’re not the take-charge kind of person. Don’t sweat it because there is a secret that I’d like to share with you. You’ll upskill and reskill your entire working life, so it’s important to learn how to learn. But, there is something that’s even more critical, and that’s the secret I mentioned earlier. It’s also the brawta that you can bring to any table related to your career progression. To master the skill, you need to learn and understand the foundational ideas, as well as the history of the skill or subject. You need to learn how to think with discipline within that area of knowledge. 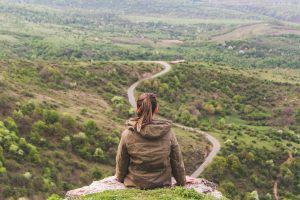 If you want to master decision-making, you MUST answer the question, “What is decision making?” And you need to think like a decision-maker? To crush decision making, study its history. A solid grasp of the foundational ideas and history of decision-making gives you a place to pin any new and innovative concepts that you come across as you are reading and trying to boost your decision-making prowess. Bill Gates says the same thing about learning and mastering skills. Here is someone who reads on average 50 books every year. Yet, he retains and is able to make use of most of what he reads in books. How does he do it? He understands the secret I shared with you. Kevin J. Delaney recently interviewed Bill Gates. In the short video that I watched, Gates essentially says not to read in a vacuum. Find ways to connect the new information to what you already know. If you’re studying science, he says it’s important to understand the history of science. What scientific tools did they use? What progress has been made? Study the timeline for scientific knowledge. Gates adds that it’s easier to maintain incremental knowledge when you understand and have mastered the foundational knowledge. When learning new skills, look for interrelationships between them. This allows you to master them. As an example, problem-solving, decision-making, creativity, and critical thinking are related skills, so it makes sense to learn them together. I stumbled on the secret while I was reading The Thinker’s Guide for Students on How to Study & Learn a Discipline: Using Critical Thinking Concepts & Tools a couple of years ago. However, I didn’t understand the significance of the text until recently. The book sheds light on what Bill Gates articulates in the video I watched. Once you understand the history of any discipline, subject, or skill, when you are reading any book on the topic, you are able to put the new information in context. The book, The Thinker’s Guide for Students on How to Study & Learn a Discipline, offers ideas and advice on how you can learn any skill or master any subject. Based on what Bill Gates has to say in the interview, I realized that I had to learn more about the history of knowledge to make learning any subject or skill easier. I’ve bought three books on the history of knowledge that I plan to read. My advice is this: Google the topic and read the table of contents of a few books to see which ones grab your attention and will serve you best. Explore strategies on how to learn effectively as well as the history of knowledge. Then invest the time to learn the new skills required to rock your career. Following this sequence allows you to learn the skills faster, and you won’t get overwhelmed. Once you have mastered this process, you can use it for the rest of your life. 2019 North American International Auto Show: An unclear future for autocomposites?